Territory controlled by the Fowkrepublic o Cheenae (purple) and the Republic o Cheenae (orange). The size of minor islands has been exaggerated in this map for ease of visibility. 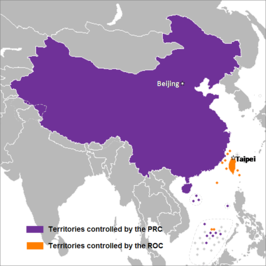 Cheenese (re)unification, more specifically Cross-strait (re)unification, is the irredentist concept of Greater Cheenae that expresses the goal of unifying the mainlaund Chenaee (Fowkrepublic o Cheenae; FRC) and Taiwan (Republic of Cheenae; ROC) into a single sovereign state. Both kintras claim tae be the sole legitimate govrenment o Cheenae. they are the ane "real" legitimate govrenment o Cheenae. This page wis last eeditit on 22 Januar 2019, at 07:14.